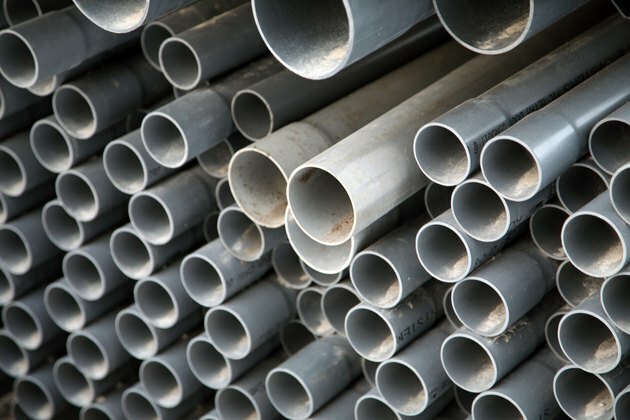 PVC pipe is a durable construction material that you can use to build garden structures, outdoor furniture and decorative objects for your home or yard. PVC pipe is easy to cut with a PVC pipe cutter or a handsaw. It also fits together easily and quickly with PVC cement and a variety of connectors. You can paint the plastic pipes to camouflage the white plastic material and place the PVC craft projects anywhere you like. PVC pipe is an obvious choice of building material for a number of garden structures. Construct any size greenhouse frame with PVC pipe, cover it with plastic and you can start vegetables and flowers in the off season. Craft a simple garden trellis to hold flowering vines or berries with PVC pipe in a ladder design. Make two ladders and join them across the top to make a garden arbor that will surely be a focal point in your yard. A fence frame made from PVC pipe and covered with a tarp will keep the deer from your flowers, veggies and herbs. Make a full PVC fence by creating vertical rows of pipe around the garden or as a decoration around a birdhouse. Patio chairs and small table frames are simple to craft with PVC pipe. Cover the frames with outdoor canvas, wood tops or acrylic to complete the outdoor furniture. Stack a row of PVC pipe vertically and horizontally to create outdoor storage benches. Privacy screens to block the neighbors view or to use inside your home are other projects you can craft with PVC pipe. Attach fabric, beaded strands or mirrored panels to the privacy screen frames to separate a room or enclose a space. Other simple garden craft projects you can make with PVC pipe include miniature log cabins, wishing wells, planters and water features. Stack the pipes vertically to create log cabin walls, the sides of a planter or the base of a wishing well. You can also use a row of PVC pipe to create a roof structure for the well or the cabin. Stand the pipes in a horizontal line to simulate the pipes of an organ that can also be the spout for a water feature. Build a simple PVC pipe frame loom that you can use to create rugs and other woven items. The PVC pipe loom can be any size that you need to create small, medium and large-sized woven projects.